Melissa de la Cruz was born in Manila, Philippines in the early 70s (9/7/71 to be exact). She was eleven when she first appeared on the cover of the magazine Mod, Jr. She wore a Popeye shirt and white pants and sported a Princess Di haircut. It was her only attempt at child modeling. Her family moved to San Francisco in 1985 and she attended the Convent of Sacred Heart, graduating Salutatorian. Her novel, "Fresh Off the Boat", is based on her high school experience. Melissa moved to NYC to attend Columbia U. Her junior year, she was voted Class President. She wasn't re-elected because she spent the treasury budget on a black-tie ball. She graduated with a degree in English and Art History and took a job as a computer consultant. She was a COBOL programmer for a large investment bank in New Jersey and then a Visual Basic programmer for a small Manhattan software company that never went public; next, she was a senior consultant at Morgan Stanley. She wrote her first novel at 22 and the next at 23. Her agents were unable to sell them. A Simon & Schuster editor suggested she try writing for magazines so Melissa started to write for the New York Press and published her first essay in 1997. Her stories covered sample sales, reviewed nightclub, and even interviewed a few strippers that belonged to Mensa. 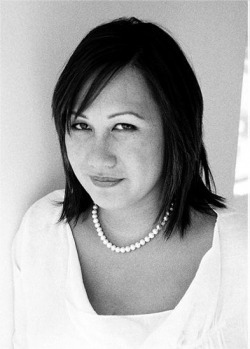 In 1998, she was one of the founding editors of Hint Magazine. At age 27, Melissa sold her first novel to Simon & Schuster. Cat's Meow was published in 2001. A few weeks before the Cat's Meow book party, Morgan Stanley laid her off during the economic bust of '01 and she decided to try her hand at free-lancing and began writing full time. She married Michael Hoch Johnson in October 2002. She has written for Marie Claire, Harper's Bazaar, Seventeen, Cosmopolitan, CosmoGirl!, Teen Vogue, The New York Times, Allure, Glamour, McSweeney's, and other obscure/dead publications. Melissa's next book, How to Become Famous in Two Weeks or Less, co-written with Karen Robinovitz, was published in 2003. Movie rights were sold to the Walt Disney Company and reality-television rights were sold to Reveille/Universal. Neither was ever made. Her first novel for teens, in conjunction with Alloy Entertainment, The Au Pairs, was published in 2004. It was inspired by the summers she and her husband had spent in the Hamptons. The book was published in 10 countries and was optioned by the Warner Brothers network. Her next work, "The Fashionista Files: Adventures in Four-inch Heels and Faux-Pas" (again with Karen Robinovitz), was published later that year. Jane Magazine described her a "socialite", Melissa's lifelong dream. The Au Pairs Skinny Dipping and Fresh Off the Boat were published in 2005. Blue Bloods, The Au Pairs Sun-Kissed, and Angels on Sunset Boulevard were published in 2006. Blue Bloods 2: Masquerade and Social Life were published in 2007. Melissa is also signed up for a whole bunch of books in the coming years, including The Ashleys (October).